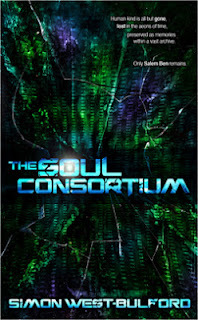 Simon West-Bulford coincidentally works on the same site as me though we'd never met before the book was released, 'The Soul Consortium' is a slick-looking volume with an eye-catching cover, though the generous type face means it's not as long as it looks. It is however a gripping read. The setting is in the far future. I mean really far. Think Greg Egan squared. The last human, Salem Ben, lives alone with an AI, immersing himself in the recorded lives of the dead to pass the millennia. The high-tech setting, quantum physics and esoteric philosophy at first glance lead you to believe you're in for a hard SF extravaganza, but there's far more to the book than that. Detecting aberrations in the Soul Sphere where countless human lives are recorded and stored, Salem Ben decides to investigate by re-living the affected lives. The technology is totally immersive, so these lives are lived and told from the viewpoint of those characters. An interesting selection they are too - a serial killer and a psychic from our own past, a monk from the far future and the ages-old woman who created the Soul Consortium. The lives they lead are told in gritty realism, with all the horrors of their existence played out in sometimes visceral detail. They are all convincing and the monk in particular becomes a fascinating story in his own right. The way these past lives gradually link up, adding hints and weaving threads, connected by Salem Ben's own slowly revealed history, make this a stand-out debut. I was thoroughly drawn in and enjoyed it to the end.